Happy Thankful Thursday, my fellow foodies! What a month it has been. In the past few weeks I’ve moved into an amazing apartment in the heart of my beloved city by the bay, and started an exciting new job with a really fantastic group of people. Between getting settled in my new digs and learning the ropes in the office, I’ve had my hands full and then some. Although I definitely fell off the grid for a little while there, I’m excited to be back with what has to be my favorite bite-sized taste of Summer. I’m not sure if something with only four ingredients and minimal preparation can be called a recipe, but nevertheless I’m super excited to be sharing it. 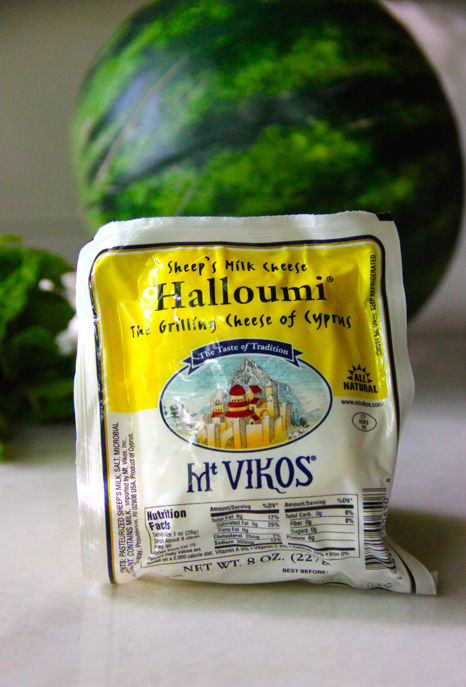 For those unfamiliar with halloumi, it’s a cheese native to Greece that is famous for its high melting point. As such, it’s perfect for frying, or in this case grilling. Halloumi is delicious on it’s own or paired with a simple baguette, but its salty flavor also pairs beautifully with fresh Summer fruit. 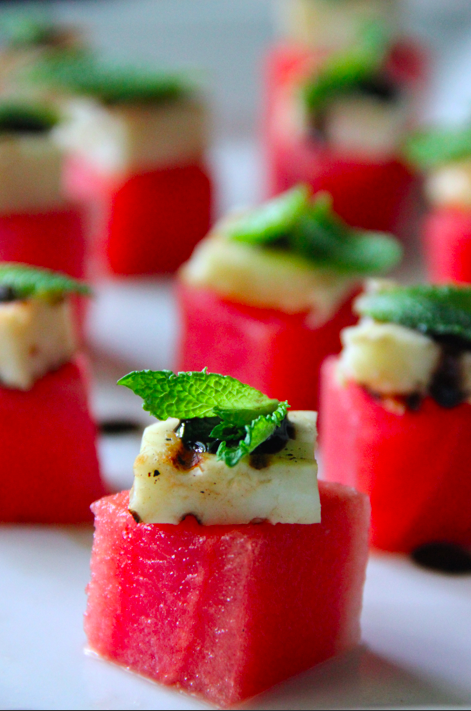 I don’t think that Summer would be complete without watermelon. Childhood Summer barbeques were never without an abundance of bright watermelon wedges peppered with black seeds, and I remember countless hot afternoons splashing in the pool playing “Greased Watermelon Polo” with a massive, heavy melon covered in Vaseline. While the Summer weather in San Francisco makes its lazy debut around September, watermelon season is in its prime. 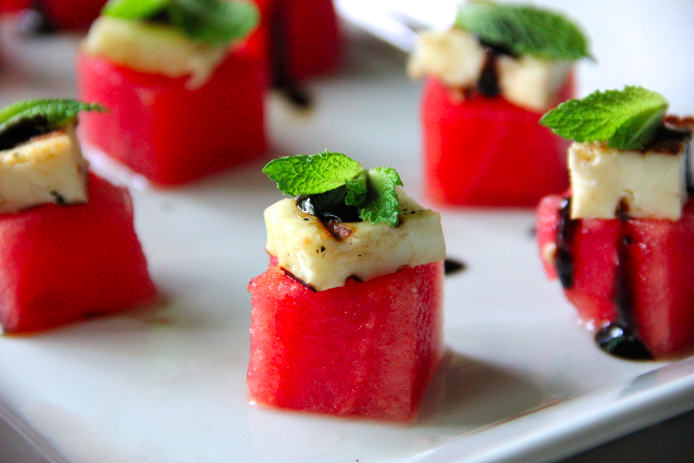 These bite sized morsels are easy enough to prepare for a casual picnic, while sporting an aesthetic appeal appropriate to passed hors d’oeuvres at a nice dinner gathering. While the halloumi is definitely the star of this dish, it wouldn’t be complete without the addition of the balsamic glaze. 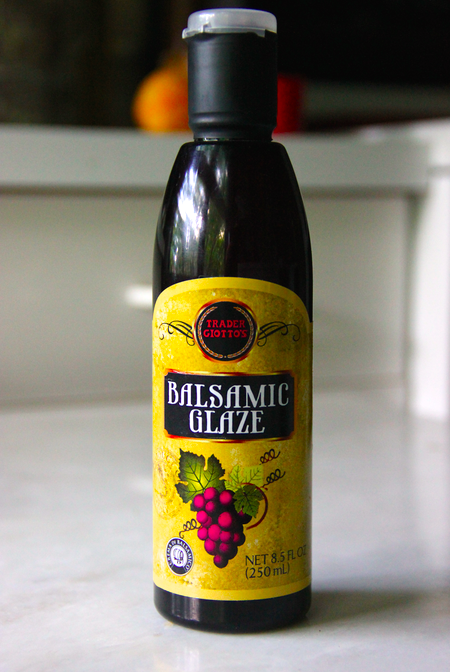 I can’t begin to tell you how many times I have struggled with making my own balsamic reduction. Timing is everything when attempting it as home, and while it’s not necessarily difficult to do, I could never get the timing or the consistency just right. Thanks to TJ’s, problem solved. If you thought Joe Joe’s or Cookie Butter made Trader Joe’s your local supermarket hero, just wait until you try this stuff. (Side note: it also makes the perfect, solo-ingredient salad dressing). Cheers to Summer, sunshine, and the simple pleasures in life. This looks divine and refreshing! Hayley and I hope to connect with you at some point!